Malcolm and Ros Christian had always been intrigued by cemeteries - they tell so many stories and visiting them had been a source of fascination. But they had never considered being more permanently in one before their time, as it were. In 1985, when the chance presented itself to buy the little Wesleyan Methodist Chapel at Caversham in what was then a rather rural part of the Natal Midlands, they could not resist. As it happened, they were at a point in their lives where some serious decisions had to be made. 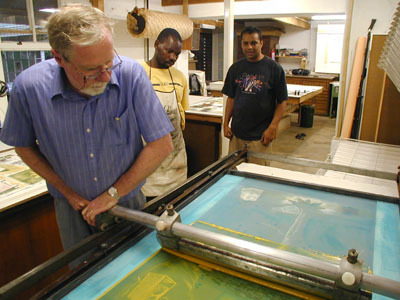 A lecturer in Printmaking at University of Witwatersrand, Malcolm had been offered a post at another premier university and a major relocation was on the cards. Taking their two young children to live in a rural location seemed a better prospect than another decade or so spent in an urban environment. 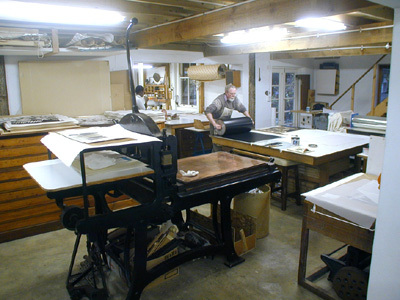 In addition, there was Malcolm’s dream of starting a private printmaking facility, similar to those he had visited in Britain, but one that would offer a range of printmaking techniques. The answer was clear and The Caversham Press came into being. Caversham was a space of rolling hills, fresh air, gravestones and new challenges. The family set out on a whole new way of life, grabbing the opportunity to realise a dream, albeit daunting, and setting in motion a chain of events which have led to a life always filled with interesting people and plenty of hard work.The chapel was transformed into a studio space, and a house was built adjoining it, carefully placed so as not to disturb any of the graves. Over the years the studio building and property have evolved as the needs of the Press have determined. In a way the Christians have been like those early pioneers who rest so peacefully in the garden. A silent presence, they have been a part of this valley since their arrival in the 1850’s after a long voyage from England, and a trek with ox wagons from the coast. They came to start a new way of life, ready to face the unknown, and to make what they could of the challenge. And so did Malcolm and Ros who hope that they too, have left some vestige of their endeavors, not so much on the land, but in the people who have shared this special place with them over the years.